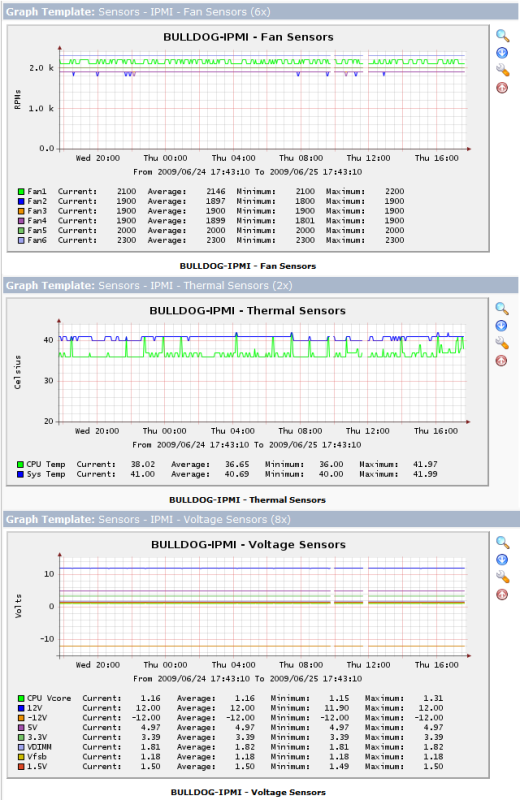 I have been working to get different kinds of hardware monitoring working in a consistent manner. This is the package for using ipmitool to query a system over the IPMI management interface. This model uses ipmitool to ask the target for all known sensors of the requested type. Add the appropriate data query to a device that has an IPMI interface, and then create new graphs for each of the sensors that you want. Each selected sensor will be created as an individual data-source and graph, like with interfaces. Last edited by ehall on Tue Jun 23, 2009 11:26 am, edited 11 times in total. At first it was cutting off the last character of the hostname so it wasn't working so I had to patch it. I'm a newbie at using cacti so I'm not able to make it work as a plugin. Someone said that you just put the .php scripts in /usr/share/cacti/scripts/ but that doesn't seem to work. Don't do that. The query definition XML uses comma-separated parameters, and the script chops the commas off. Since your patch is not doing that anymore, hostname lookups are now going to be for "hostname," (with the comma) and the subsequently fields will also be imbalanced. First make sure that the script works with the commas using something simple like "php ipmi_sensors.php VOLTAGE, 192.168.98.131, ," (the empty parameters will be filled in by the script). Second make sure the files are in the right place. The PHP script file should be in your $cacti/scripts/ directory (you seem to have it in an ipmi subdirectory), and the XML files should be imported (using the "Import Templates" menu option on the left side of the console screen). Third make sure the IPMI device has an IP address, and that it responds to SNMP or ICMP ping (set community string to blank to bypass SNMP lookups). Cacti will not execute any lookups for the device if it does not respond to basic probes. Once that's all working, add the data query to the device in the console screen, and then use the verbose option to display the discovered sensors. If there aren't any sensors and the error isn't obvious, copy and paste the verbose output here and I'll see if I can spot the problem. You need to specify the hostname ("" will be treated as the hostname in the example above). You do not need to specify the "" pairs for username or password either, since they will be provided as empty strings if no SNMPv1/v2 username or password are provided. This returns nothing to me. It queries something, because it takes about 15 seconds to run over (normal ipmitool sdr query time...). I dont know anymore what kind of query to do! There is a feature to use local cache file for ipmitool sdr queries. tem can be created with the sdr dump command. That increase performance of ipmitool dramatically indeed! I just tried the scripts and I have followed the rather obscure directions on how to install this plugin. However, I still get an empty graph. I am able to get information using the ipmi_sensor.php script, but I cannot make the data available to rrdtool, or get stored in the cacti database for all that matters. I read that the data query must be entered, but I do not know what the xml data definitions file is, or how I will enter the username and password into the query so that it will work. I have 64 servers I need to constantly monitor temperature-wise, and so far this is the best way I found. I also found something about lm_sensors, but again the documentation on how to implement this is very limited. I will be more than happy to write the steps necessary to get this thing up and running if I only had enough information to do it. I have similar problems. I've tried to use the script and xml-files, ehall has build, but I think, there are several additional steps to do, which I don't understand. As far as I understood, the files from ehal provides data and graph templates and a script to collect the data. The script is working without problems. So I tried to create the cacti graphs. To do this, I need the "appropriate data query" for the host. This data query is not in the zip-file and i have no idea, how to create it manually. Anybody here, who can give two beginners in cacti the needed help, to get this working? It doesn't appear that the original tar file had all of the templates. Don't know how it went so long without being noticed, but all of the dependencies were supposed to have been included. Anyway, I uploaded a new one that should have everything. All of the XML files are exported from cacti 0.8.6i. Import them all, starting with the data templates, then the data queries, then finally the graphs. Copy the .php script to your cacti scripts directory. IPMI uses authentication, but cacti does not provide any means to specify additional variables to the script-query interface, so you have to figure out some kind of way around this. One option (what I use here) is to create a null IPMI operator account on your machines. You can do this with "ipmitool user enable" (with no username) and then use ipmitool to further tweak the privileges and whatnot. If the script does not receive any username parameters (see bottom of post) then it will use the special NULL username and password to perform the queries. Another option is to change the script source code. By default, if no username is provided on the command line, then the script will use the special NULL username (referred to above) with a pair of empty quote marks. You can change this to use another username if you want, so that the absence of a username and password will cause the script to use the username and password that you want. You'll need to do the same for password. It is possible to pass a username and password on the command-line, but that comes from overloading the SNMPv3 fields in cacti, and that has very limited applicability in most cases. You would need to create a host definition that uses SNMPv3, make sure that the host responds to pings (and there may be some other cacti tweaks like not probing SNMP), etc. If your host uses IPMI on a different IP address than the operating system uses (pretty common) then this can be a feasible method, and I've used it here myself. Generally speaking the absolute simplest thing to do is use the ipmisensors module for lm_sensors, and get the data from net-snmp lmsensors hooks. This script is really for people that need to use IPMI in particular. IPMI is hard and ugly, I know. Do i have to create them manually? If yes, can you give me a hint, how? long time no news . Perhaps anybody can give us a hint, how to handle the missing xml-files?